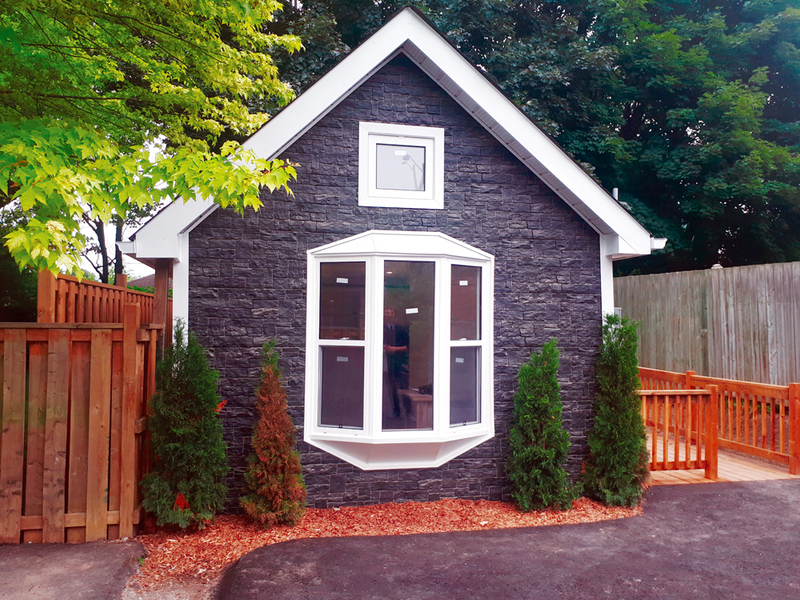 Oshawa’s only tiny house is located at 96 Queen Street. In 2018, the UN projected that by 2050, 68 per cent of the world’s population will be living in urban areas. That’s around 6.7 billion people. A growing trend within North America is to intentionally downsize in favour of smaller, more sustainable houses. Enter the tiny house. Tiny houses are typically 400 sq. ft. or less, and can significantly limit a household’s use of natural resources. The lower economic burden is also an incentive for people to switch over to the tiny house movement, an important link to actualize the potential for urban sustainability. In America, the average cost of a tiny home has been reported to be anywhere between $20,000 for build-it-yourself projects and up to $60,000 on listing websites. In February 2019, the MLS statistics for Oshawa indicated that the average house price in Oshawa was $486,647. In the City of Oshawa, tiny homes are legal and treated as a single detached dwelling. Tiny homes cannot be mobile, or else it will be classified as a mobile home, and no zone in the City of Oshawa currently allows for mobile homes. A building permit is required for the development of a tiny house, and the city’s planning department may enact a Site Plan Control for Architectural Design, to look at the design features, landscaping, and how well the home will conform with the neighbourhood. A development charge may apply to the building of a tiny house. For more information on the conditions surrounding the building and placement of tiny homes, refer to https://www.oshawa.ca/city-hall/tiny-homes.asp. The small surface area, less space to heat and cool, fewer lights, and fewer appliances are all aspects of the tiny home that contribute to the lessened footprint and cost. Tiny homes also force their inhabitants to have a more engaged relationship with consumerism. It has become a symbol of social status to have a bigger and more beautiful home than our neighbours, and the tiny house challenges this idea. Displaying or showing off the power that comes along with having a large home often leads people to have no regard for the environmental or communal impact that these types of homes may have. The quantity of goods and excess that tiny home owners have constantly needs to be monitored, and whether a possession has the potential to be multifaceted in its use. This minimalistic way of living cuts down on the environmental impact that manufacturing, shipping, and displaying products can have. Another key area of sustainability in tiny homes is in waste. Most tiny homes are equipped with composting toilets, which are inexpensive, easy to install, and do not require water, plumbing, or septic connection. Finally, and perhaps, most obviously, tiny living requires people to interact with the outdoors more often. Due to the scarcity of living space indoors, people are pushed outdoors for recreation and entertainment. The tiny house truly brings together so many facets of sustainability that we can so easily implement in our everyday lives. As the global population grows and becomes more concentrated in urban areas, it is becoming increasingly clear that the consumerist society we live in needs to be reformed. This is especially true in urban planning, with home sizes continuing to grow and consumers only wanting the biggest and best. In order to ensure that environmental degradation is limited and to account for the population density that will soon be found in urban areas, we must shift the consumerist mentality. Tiny homes becoming common in the suburban environment as accessory dwelling units would significantly contribute to the conservation of natural resources and sustainable, resilient urban planning. City of Oshawa. (n.d.). Tiny Homes: Frequently Asked Questions. Retrieved Feb. 17, 2019 from https://www.oshawa.ca/city-hall/tiny-homes.asp. Kilman, C. (2016, January 17). Small House, Big Impact: The Effect of Tiny Houses on Community and Environment. Undergraduate Journal of Humanistic Studies: 2, 1-12. Retrieved Jan. 3, 2019 from https://apps.carleton.edu/ujhs/assets/charlie_kilman_tinyhouses__4_.pdf. Tippins, N. (n.d.). Can Tiny Houses Help the Environment? Retrieved January 3, 2019 from https://greenliving.lovetoknow.com/low-impact-living/can-tiny-houses-help-environment. United Nations Department of Economic and Social Affairs. (2018, May 16). 68% of the world population projected to live in urban areas by 2050, says UN. Retrieved January 3, 2019 from https://www.un.org/development/desa/en/news/population/2018-revision-of-world- urbanization-prospects.html. Zolo.ca. (2019). Oshawa Housing Market Report. Retrieved Feb. 17, 2019 from https://www.zolo.ca/oshawa-real-estate/trends.